“Gratitude is the foundation of future hope. Hope without gratitude is wishful thinking.” Father Gordon Moreland SJ, (my beloved Spiritual Director). David Hassel, SJ. Prayer of Reminiscence. The Desert helps us to remember who we are and Who it is that loves us. Twenty miles south of Lone Pine, California the village of Olancha appears as an oasis within a sagebrush ocean. 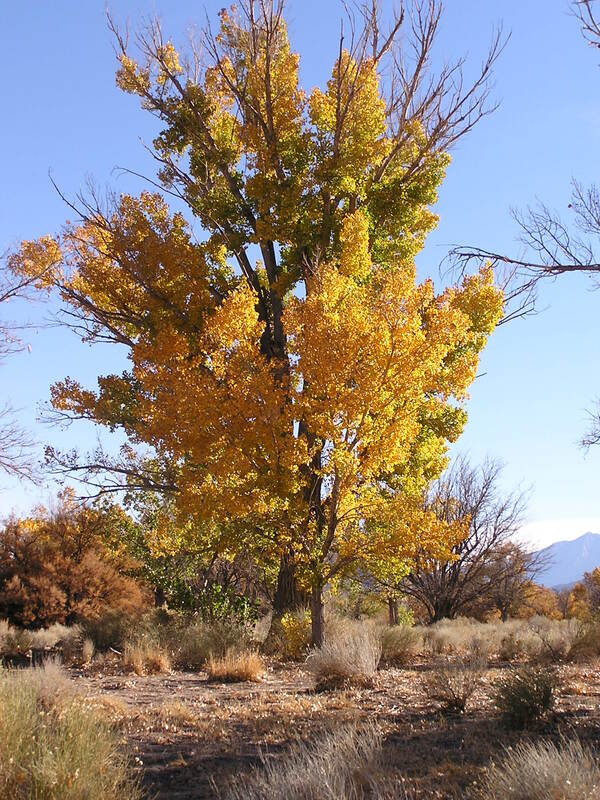 Ninety-foot tall cottonwood trees stand as sheltering sentries along Highway 395, resplendent with shimmering, golden autumn leaves. As I drive among them, leaves flutter and fall around me: Nature’s tickertape welcome. 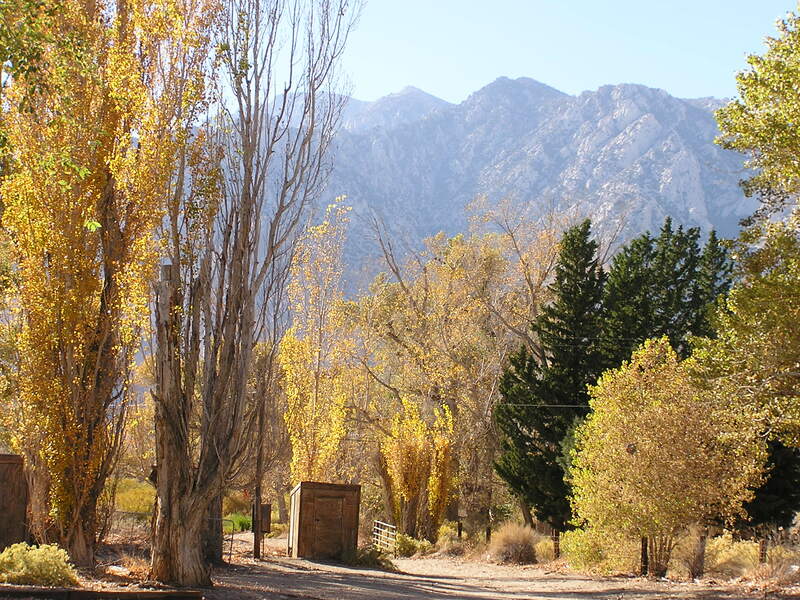 The village was a stagecoach stop 150 years ago on the way to the gold and silver mines in the Inyo Mountains. Ruins of old adobes and more recent businesses stand roofless, walls tumbling, painted with fading advertisements for beer and groceries going back to the 1930’s. For forty years, the autumn season had mixed blessings for me as a parish priest. On the one hand, football season returned! Go USC Trojans! Go Pasadena High School Bulldogs! However, it has been the season giving me the greatest anxieties. It is stewardship time, when churches (and synagogues) launch their fundraising campaigns for the new budget year. For forty years, I entered this season with apprehension and fear: will there be enough money to fund the program staff and ministries next year? I worried. One way I used that energy was in compulsive and obsessive plans for marketing, promotion, and solicitation. When I first started as pastor at Messiah Episcopal Parish, Santa Ana, CA, in 1981, our budget was $50,000. When I retired in 2011, our pledges reached $550,000. We accessed many of the fund raising techniques used today by secular non-profits. We became very successful. In fact, the Diocese of Los Angeles published our solicitation program as a nation model. Nonetheless, I was always anxious about failure and coming up short in the fund raising. My time walking out here in the rocky landscape around Olancha changed me and brought me to another place: a place of remembrance and gratitude. I learned that beyond fund-raising programs and techniques, God wants me to help parishioners to remember their personal encounters with Amazing Grace in their life crises. As they remembered, gratitude to God would flow in their hearts and they could be moved to generosity. For forty years the Hebrew people wandering in the desert wilderness of Sinai. It was long enough for the entire generation born in slavery in Egypt to die off. Even Moses himself could not enter the Lands of Promise. But in that desert space over those years the people became entirely dependent of God. We read in the Book of Exodus about their foundational story of salvation in the desert, which the prophets preached must be remembered. In that empty place, God provided manna, a strange substance secreted by desert plants and sustained the Hebrew people. Manna could not be stored up. If you tried to do that, either it melted in the hot sun or worms ate it. The Lord God only gave enough to make it through one more day. Thus, in the place of desolation, the people learned absolute dependency on God’s amazing grace. When they finally arrived at a point where they could see the verdant, green Jordan River Valley in the distance, Moses gave his farewell sermon. He warned them that what was ahead for them could give them abundance. But they should not forget what God did for them out there in the desert. As long as they remembered, God’s blessings would be with them. I continue walking on a trail toward Olancha Creek in autumn, the second day of a four-day retreat. By this second day, my busy mind is slowing down and my senses are alert. The crunching sands and large boulders around me come from thousands of years of wind, flood and erosion. A slow uphill climb, heart beating, breathing more intense. Listen. As I walk uphill along Olancha Creek, no water is flowing. But I do hear water. Cottonwood and willow trees rustle gently in the cool wind. I climb up over a rise of boulders and suddenly water is flowing into the creek. At some point it must disappear into the loose gravely soil, but where I am water rushes over boulders and sagebrush. For centuries, this area was a place for Paiute ceremonies, vision quests and Shamanic retreats. I hear the wind, the bubbling water, and the crunching sands. A red tail hawk shrieks above me. Memories begin to seep into my empty mind. Different interior voices can speak to us. If we do not walk with the Holy Presence, we are vulnerable to that voice you recognize well: the Critic. Memories of a recent argument or disappointment become vivid. Feelings begin to boil. Negative, critical thoughts seep into to this tranquil setting. Memories of how I have disappointed or hurt persons in the past begin to surface. This flood of recollection can pull me down into despair. Ignatius names this as encounters with the dark spirits. Augustine reminds us that our memories are not just frozen snapshots of our past. They have a dynamic and powerful influence on us. As I walk, memories do bubble up. The most important thing I can do at this time is to invite the Lord to be with me here in my desert walk. Left alone with some of my memories, my poor decisions and the hurt I have done can haunt me. When I was expelled from the University of Southern California in 1966, it seemed like the end of academic life. I was a huge disappointment to my parents. However, as I look back at that failure through the eyes of Christ, I can see how God was waking me up to my acts of self-deception and denial. A turn in the road led me to another college, where, like the desert Exodus, my life was stripped of entitlements and I was dependent of God’s amazing grace. This led me deeper into my life with God, toward seminary and the priesthood. As I walk for most of the day around this rocky, riparian landscape, memories flow in and out of my mind. The ever-active Critic resurfaces. Because I know I am loved and blessed by a Holy Presence, I can look again at painful memories. I can look into those hidden, secret places where I am most vulnerable. As I simply review my life with the Holy Presence, I am liberated from defenses, mental blocks and self-destructive thoughts. Hiking through the stark beauty of the desert in autumn takes my breath away. I ask the Lord to guide my understanding of these memories and how this understanding can help me serve God as a more compassionate, grateful person. It comes like the wind and surprises me. My heart wells up with deep gratitude to God as memory opens up in greater clarity and remembrance of all the places where I was at the end of my resources, running on empty, but the Lord brought me through the wilderness to places of blessing, joy, peace, love and hope. After several hours of walking these desert trails, I can see from Nature’s clock that it is time to return to my car. The sun sets early here behind the Sierra Nevada. When I get back to the car, I see from the dashboard clock I had been hiking for five hours. Driving back to the Dow Villa Motel in Lone Pine, where I frequently stay, I have a powerful sense of heightened alertness to the Spirit and for other memories that could be lifted into consciousness. In the motel room, I write in my journal a summary of my experience and what I heard the Lord saying to me. Memories of these encounters with the Holy become foundational in our lives. They are touchstones to which we can return to help us remember that we are beloved of God and that all will be well. As you and I walk with the Holy One in the desert, or wherever you are, memories of how God has been with us in the wilderness become foundational and pull our hearts toward authentic gratitude. “Gratitude is the foundation of future hope. Hope without gratitude is wishful thinking.” What that says to me is that my remembrance of those vivid times when God’s amazing grace has been with me anchor me as I step into the future in hope, because my hope is that God will continue to be there with me. If I do not have memories of gratitude to God for blessings and presence with me in the past, then all I have, as I walk alone, is wishful thinking, hoping for the best. “Prayer of Reminiscence,” by David Hassle, SJ (Loyola Press, 2007). The Jesuit Guide to (Almost) Everything: A Spirituality for Real Life, by James Martin, SJ. Pp. 95-103 present a helpful outline of the Examen of Conscience, a daily meditation of the review of all the events and people encountered in each day. The process of this meditation fosters a spirit of gratitude for God’s grace and a growing awareness of God’s presence in our lives. This entry was posted in Blog and tagged Augustine, desert spirituality, gratitude, Ignatius, Olancha, Owens Valley, pilgrimage. Bookmark the permalink. I always look forward to reading what you write. It inspires my soul. Thank you! Most excellent Brad! I have the same thoughts & feelings each day when & take my hike into the dunes nearby where I live here in 29 Palms! So true & refreshing only in the desert, I like being lead about in the ‘waste howling wilderness’! Thank you! you have a fine mind father brad i love to read your about your introspective journeys.